So how realistic do you like your simulators? Some racing fans are willing to spend thousands of dollars on displays, controls, and seats that move and shake to enhance their virtual driving experience. But a company called CXC Simulations is taking things to a whole new level with a new force feedback steering wheel that’s actually strong enough to injure the driver. 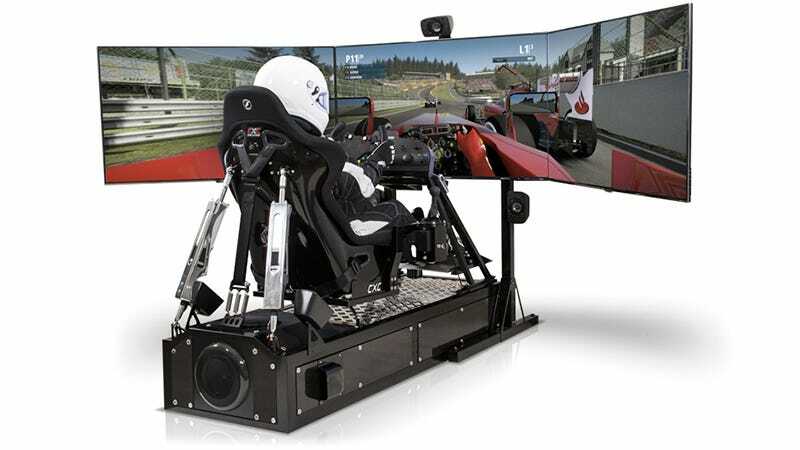 The company’s Motion Pro II simulator starts at a hefty $54,000, but that includes multiple widescreen displays, speakers, a working dashboard, pedals, and a racing seat that twists and turns along with the action on-screen. It’s so realistic that real-life racing drivers can actually use it to practice a course, but CXC Simulations wanted to improve the setup even more. The Motion Pro II’s steering wheel has recently been upgraded with a new servo motor that’s now connected to directly to the steering shaft, eliminating the need for belts and gears which can reduce power. As a result, while the Motion Pro II’s original steering wheel could generate two newton meters of force feedback, the new one can now generate a whopping 16 Nm. So if your virtual car were to hit the wall while driving the simulator and you didn’t let go of the steering wheel in time, it now has more than enough torque to recreate the same crash forces you’d experience in real life which would easily break both of your wrists. It’s a terrifying thought, and that’s why CXC obviously limits the power output of the new servo motor it’s using. A realistic driving experience is one thing, but the whole point of a simulator is take all the danger out of racing.